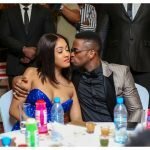 Tanasha Donna and Diamond Platnumz have been dating for a while now and from the look of things these two seem to get stronger everyday. Despite both living in two different countries they often make it possible to see each other; however most Tanzanian on Instagram feel that this relationship will not last. Even with the negative vibe coming their way, Tanasha continues to prove that she will not be living her man anytime soon. Just recently through her Instagram page she a photo of the Tanzanian singer and went on to caption it; How’d I ever get so lucky Jamani? ❤️❤️ I thank God for you everyday Diamond Platnumz dismisses side chick This special message comes just a few weeks after Diamond Platnumz exposed his former ex side chick for trying to ruin his relationship with Tanasha. Diamond Platnumz went on to share WhatsApp receipts showing how Lynn had been trying to get his attention but he kept on pushing her away especially because of his relationship with Tanasha. well, I guess he finally decided to change after Zari left. The post “How did I ever get so lucky!” Tanasha Donna’s special message to Diamond Platnumz appeared first on Ghafla! Kenya. Previous Post: 1, 2 get a tako… Is this new Kenyan song creative or complete garbage?